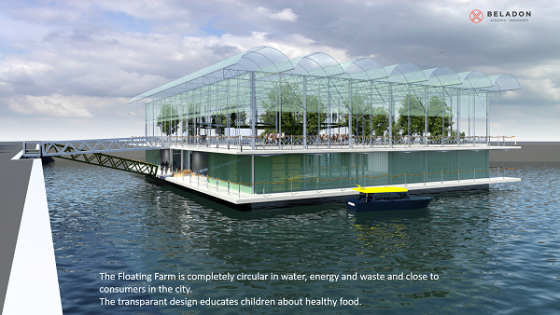 The world’s first floating farm, to be built in Rotterdam, has recruited two dairy farmers and a herd. Albert Boersen and Myrthe Brabander will be the faces of an experimental Floating Farm and their Montbéliarde cows its moos. The AD reports on Thursday that the grass is already growing for Dutch floating projects developer Beladon, which plans to build a 1,000 square meter floating platform on the harbour. The aim is to produce 800 litres of milk a day and, potentially, yogurt or Comté-style cheese. It follows a trend of ‘urban farming’, in which food production is brought back to cities where people live – for example, the UrbanFarmers project cultivating fish and salad greens in an empty Philips office block in The Hague. Applying for the job after studying in Leeuwarden, he added he expected his cows to be very curious and sniff around the structure. According to Beladon plans, it will be built in concrete, with galvanised steel frames and a membrane floor that lets cow urine soak through; robots will top up food stations and mop up dried cow dung. The cows will also be able to cross to a pasture on real land, which is already growing. The project is due to cost more than €2 mln and is financed by private cash. It was inspired after Peter Beladon, chief executive of the developer, visited New York during Hurricane Sandy, saw the disruption to food supply, and decided to build an urban farm. He has previously developed other floating projects. Andrew Cobner, junior vice president of the British Cattle Veterinary Association, told DutchNews.nl that cows might feel the effects of a sea voyage, according to a 2015 article on vehicle motion and animal welfare. However if the cows do feel bad, he said, they would ‘look a bit drool-y and uncertain’.